FLIP: How to Find, Fix, and Sell Houses for Profit is essentially two books in one. Authors Rick Villani and Clay Davis explain both the practical and the experiential aspects of &#8220;flipping&#8221; a house for profit. Villani and Davis, who are the senior executives of HomeFixers Corp., North America&#8217;s leading real estate rehab franchisor, drew upon their experiences of personally investing in or consulting on more than a thousand flip projects to write this book. FLIP is the third book to be released in the best-selling Millionaire Real Estate Series. The authors explain why each stage is important and then give specific action items, checklists and/or formulas to complete each stage. For instance, in the FIND stage, the authors cover what makes a good investment property, what makes a good neighborhood, how to target a neighborhood, how to generate leads to find properties and how to qualify those leads. In the ANALYZE section they categorize common improvement opportunities into lists of Must-Do, Should-Do, and Could-Do tasks and in the FIX discussion they take a detailed look at the 50 steps for rehabbing a house. Other topics include strategies for flipping houses in any market, a discussion of the pros and cons of part-time vs. full-time flipping, and a list of the 101 most common tasks involved in home flipping. Unlike other how-to books about fix-and-flip projects, FLIP includes narratives at the end of each stage to illustrate the real-life highs and lows of flipping houses. The purpose of these stories is to help readers understand the gap between theory and practice by exposing them to circumstances that can crop up during each stage. The fictitious characters in these stories include a retired couple, a single working professional, a young married couple and a veteran &#8220;flipper.&#8221; All the characters approach their fix-and-flip projects differently, giving readers several scenarios from which to learn. 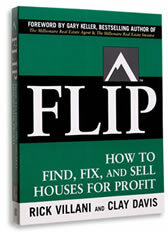 As Villani and Davis explain in their book, &#8220;We have absolute faith in our model, but there&#8217;s no way a how-to description of the process can substitute for the actual experience, any more than reading a recipe can replace baking a cake.&#8221; By weaving true-to-life narratives into the practical, systematic steps of flipping a house, FLIP enables readers to feel as if they already have a few projects under their belts by the time they finish the book.